Where do I use my My Nametags voucher code? Browse NetVoucherCodes for the best offers, find and copy a code and then click through to the My Nametags website. Pick your nametags and once you’re finished head over the checkout. Paste your code into the box provided and click ‘Activate’ to redeem your savings. You can then continue to the next page and enter your shipping and payment details to finalise your transaction. The UK store My Nametags stocks and sells long lasting, easy to apply name tags for 1000's of uses. They have colour stickers, colour iron-ons, Hello Kitty labels, Mr Men and Little Miss name tags, black and white stickers, black and white iron-ons and black and white mix sets. All these can be designed by yourself with your own name, or your children's name, and added to items to ensure there's no losses or confusion at home and at school. You can put the name tags on uniforms of all kinds, gym clothes, sports kits, school supplies and shoes. The name tags can even be used for arts and craft purposes! Stick on name tags are easy to apply and cheap to buy. They're durable and waterproof, making them perfect for labelling clothes and school uniform and they're also suitable for the dishwasher, microwave or sterilisers up to 90˚c. Stick on name tags are available in 1000's of design combinations. 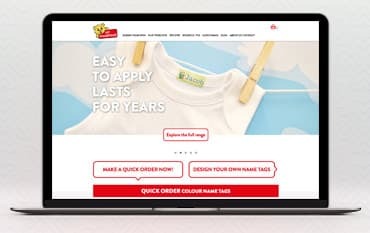 Order the most popular designs on the My Nametags website or design your own to make them personal to you or your child. Coloured stick-on name tags and black and white stickers can both be stuck onto shoes, bags, DVDs, iPods and other equipment, so no matter what you need them for, you can be sure they stick right and last. Iron on tags are applied directly on to your fabric, so these are the perfect solution when labelling items without a care label e.g for socks, underwear and pyjamas. Iron on tags is also ideal for labelling the clothes of children that don't like having care labels in their clothes, so you and your kids can have your own way! The labels measure 30 x 13mm, so they are easy to read and identify and can fit on most items such as coats, jumpers, and socks. Order your's today for an affordable price and get them delivered to your home in no time! My Nametags are award-winning producers of colourful, characterful nametags for children and care homes, with colour stickers, classic labels washing-guaranteed for 10 years, and colour iron-on labels in a choice of customisable designs, fonts and more. Personalise everything you want with the help of My Nametags Colour Stickers. You can create a variety of different designs which can adhere to clothing and other surfaces. Pop a My Nametags voucher code into the checkout to save some money on your next order. Create unique shirts or print out sticker labels for better organization; you can also make personalised gifts for the people you love.